One of the most fun experiences is traveling to the beach with your friends, your friendship is strengthened and you can share unique moments that only the beach can offer. If you are planning to go to the beach, consider swimming with dolphins in Mexico and 4 more activities you can enjoy with your friends this summer. Picnicking is an activity that can be enjoyed in various spaces and places, parks are very common, however the beach is also an ideal scenery. We recommend bringing a beach umbrella with you so that you can enjoy your picnic without suffering from exposure to the sun. If you picnic with your friends, remember to bring a bag or container to put your trash in, be a responsible vacationer and leave the beach in the same state you found it in, clean and free of trash. The beach is an ideal place to exercise, if you go with friends you will not be short of teammates to play football or volleyball with. You could also surf, kayak, waterski o just go for a swim. Campfires on the beach are really fun, however, you first need to make sure that campfires are allowed on the beach you are on, given that some beaches do not allow them or have a designated area for them. If you can, share the campfire with friends, chat, play music, dance, eat marshmallows or sausages and have an incredible time by the sea. Whether buried in the sand or building sand castles by the sea, creating sand sculptures is a lot more fun than it sounds. Together with your friends, you could run a competition that will challenge your motor and creative skills. Did you know that there is an activity you can do with 9 other people? It’s amazing that you can experience swimming with dolphins in Mexico and share the experience with your friends. You will learn more about this incredible specie and will be a lot closer to the dolphins than you had ever imagined. You are no longer short of reasons to plan a trip to the beach with your friends. There are so many destinations that you must visit at least once. If you like the activities we have suggested, we recommend that you book in advance if the activity involves the services of a company. That way, you won’t be disappointed if there is no space left and can enjoy it without any complications. 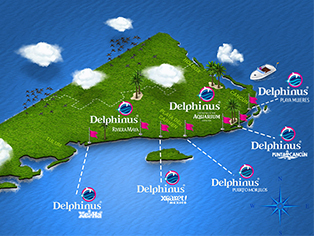 Would you like to know more about our different programs for swimming with dolphins in Mexico? Click here to find out which is the ideal interaction program for you and your friends based on your personality.